I have never worn a garment adorned with lace, and a pink blouse never enticed me to make a purchase. I just have never been into the frilly girly stuff, although I do love the look of lace, especially the seemingly delicate white eyelet made with very strong reinforced stitching. And then my very first granddaughter was born. My wardrobe suddenly seemed to expand and now includes several tops colored in fuchsia that are even adorned with a flower here and there. It wouldn’t surprise me, too, if a lacey addition wasn’t very far away. My first decorated cakes, which were rather square and stoically solid looking, featuring dark brown ganache and modeling chocolate with themes of massive rustic tree trunks, have made way for delicate pink lacey butter cream designs, frilly flowers, fondant baby animals and even ruching. And my granddaughter is barely five months old! What an influence this tiny being has had on me! 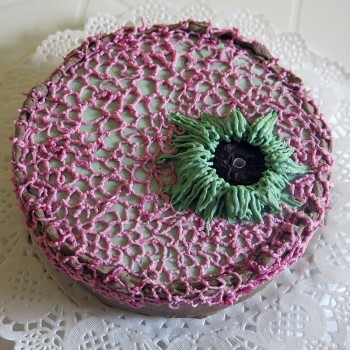 My first girly endeavor was an eyelet lace project done in butter cream using a tip number one and a pastry bag. I watered down the butter cream a bit so that it would flow better and clog up the tip less. 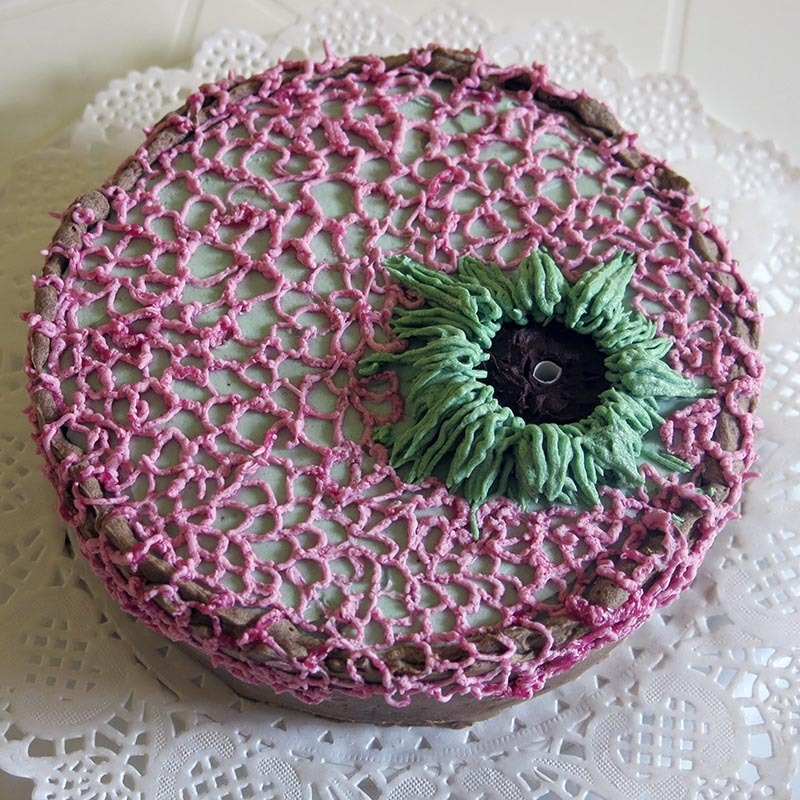 It did flow fairly well and the tip clogged up only three times, but it became much less stable, and as I piped, the pink gel color separated from the butter cream. Not a pretty sight. 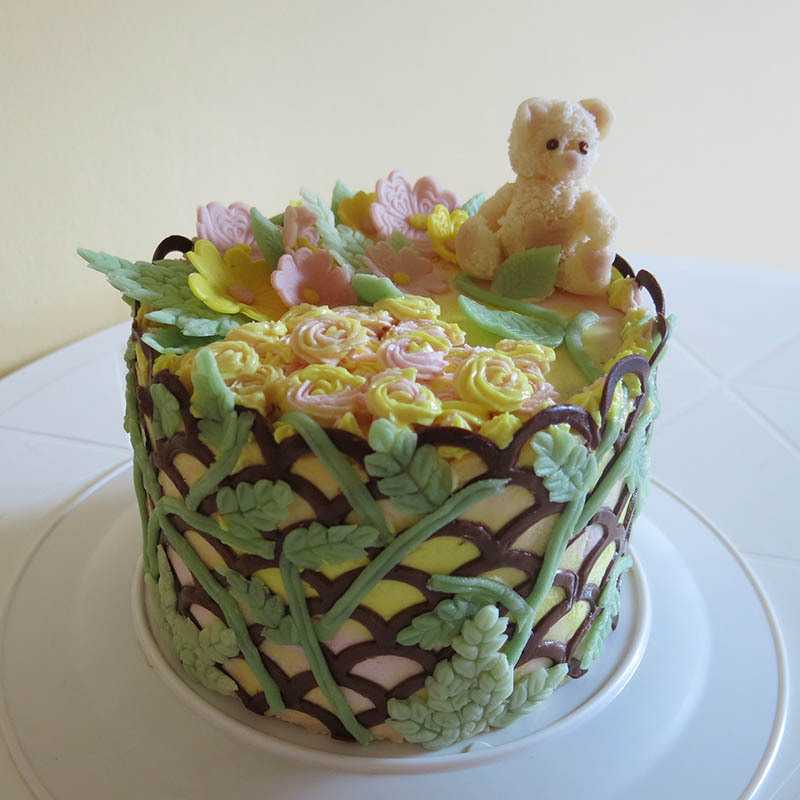 I did manage to finish the project and it seemed alright, but only for as long as the cake was kept really cold. The combination of my warm hands, our current “sharav” (extremely hot weather with easterly winds that occurs mostly in spring and early fall) plus thinned butter cream really isn’t conducive to this kind of project. 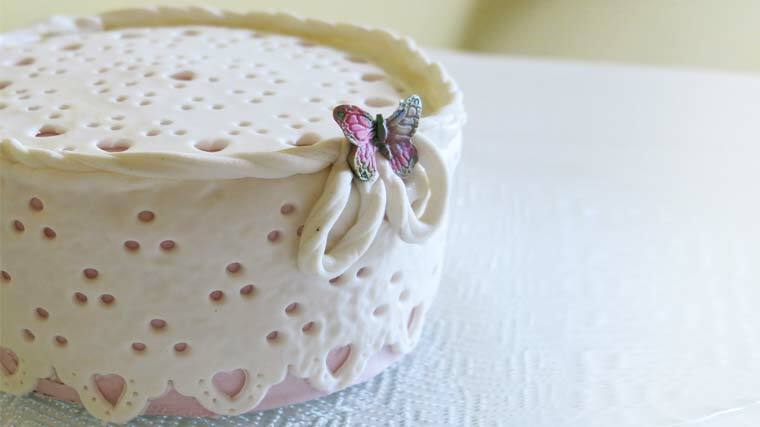 A photo of my melting butter cream lace. My second little girl project included an antique Teddy with a pink and white lattice design. This was my first ever Teddy Bear and made out of modeling chocolate. I followed an online tutorial to the tee not daring to add any bit of imagination for fear that Teddy wouldn’t be identifiable. Note Teddy’s pink collar. For my second Teddy I was much more in control and even ventured to modify the color that was originally used in the tutorial. I even added “fur”! Baby animals seemed to possess me so I continued on with a cute puppy with big floppy ears that I copied from an internet photo of a crocheted design. Completely independent of all instructions and guidelines, this project was the most fun of all. And then came ruching, a fabric design that until recently I had seen mostly on photos of wedding gowns. 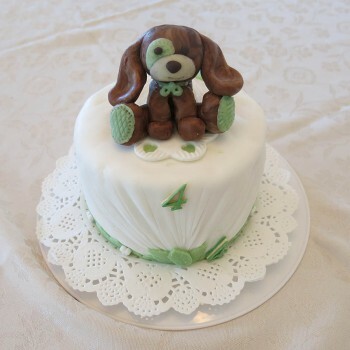 Not that I have ever looked much at or been interested in wedding gowns or wedding gown cakes, but the technique seemed magical so I incorporated it in to my granddaughter’s four month birthday Puppy Cake. Yes, she gets a cake every month! This little one keeps me on my toes and in the butter cream. I actually enjoyed doing the ruching and its affect so much that it will probably star on her five month birthday cake as well, but for that we’ll probably return to pink. The world of frills seemed to possess me so I pretty much panicked when my older daughter insisted on a dark chocolate old fashioned (meaning: “no fancy decorations, Mom”) birthday cake. 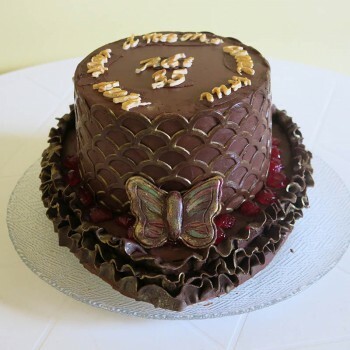 I took a bit of “poetic license”, made her the dark chocolate cake that she wanted without excessive use of fondant or modeling chocolate, but just because I felt compelled, I did add modeling chocolate ruffles … if only to the lower tier. She didn’t complain so I guess the compromise worked well enough. 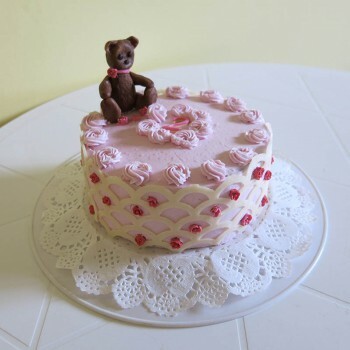 Future cake ideas that are currently clogging my mind include pink baby sneakers, a whole variety of delicate ruffles, rag dolls, more ruching, lots and lots of pink, and of course, a return to eyelet lace!